Apply any image to virtually any surface from wood to glass, ceramics, walls, furniture, artists' canvas, and more. 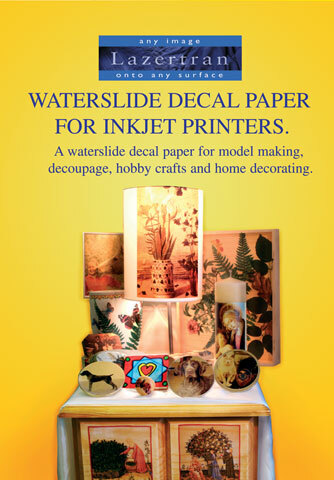 This decal paper was designed for use with inkjet printers. It does not need to be sprayed with a cover coat like other inkjet waterslide decals, and the inks become waterproof after 30 minutes allowing the decal to be put in water without the colors washing away. It is an egg shell white decal that can be made clear by the application of any oil based varnish. Each pack contains ten 8-1/2" x 11" sheets.